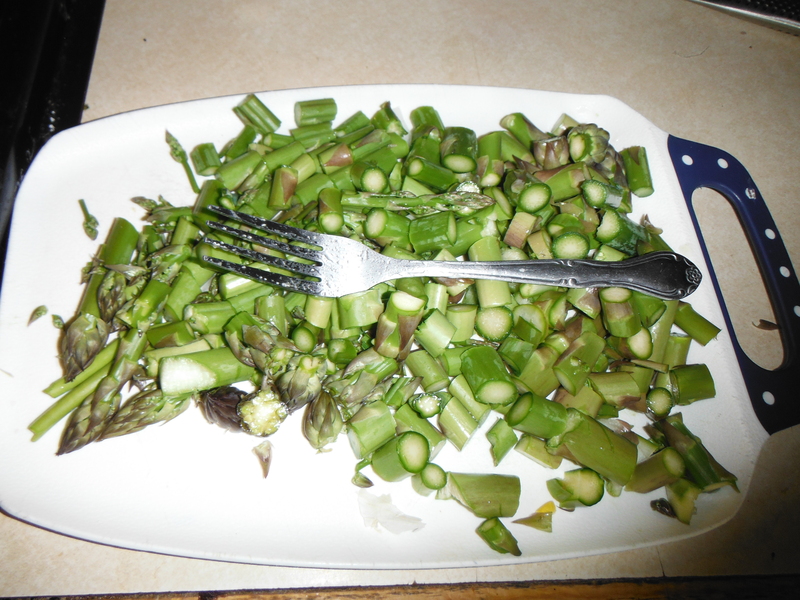 We have a few patches of wild asparagus that grow in our yard. Yesterday was so cold and dreary I decided it was time for some soup. I haven’t written much about cooking on this blog and for those who know me, this might seem a little odd. First of all- I have been cooking since I was allowed in the kitchen. Mostly because I LOVE to eat. I catered my first party when I was 12 (50 chocolate covered, custard filled eclairs.) Baking was my first love but as soon as I was allowed to play with knifes and fire, it was all I wanted to do. I made a career of it. Starting when I was 15 as a dishwasher and progressing through every facet of restaurant life. I have been running kitchens since my early 20’s and recently gave up a prestigious position as Executive Chef and head of the F and B department in a very private golf club. The hours it takes to manage these operations properly is not something I want to give anymore since it comes at the cost of time with my kids. Given this recent life change I feel fortunate that my passion for food is completely independent of having a title to go with it. I cook everyday and that has not changed. The respect that one should show to the plants and animals that die daily to sustain us is always at the forefront of my mind. It is not about asserting your will on the things we prepare but making sure your efforts give respect to their ultimate sacrifice. I have made this sound more complicated than it is. After all this is about 5 ingredients, patients and good soup! 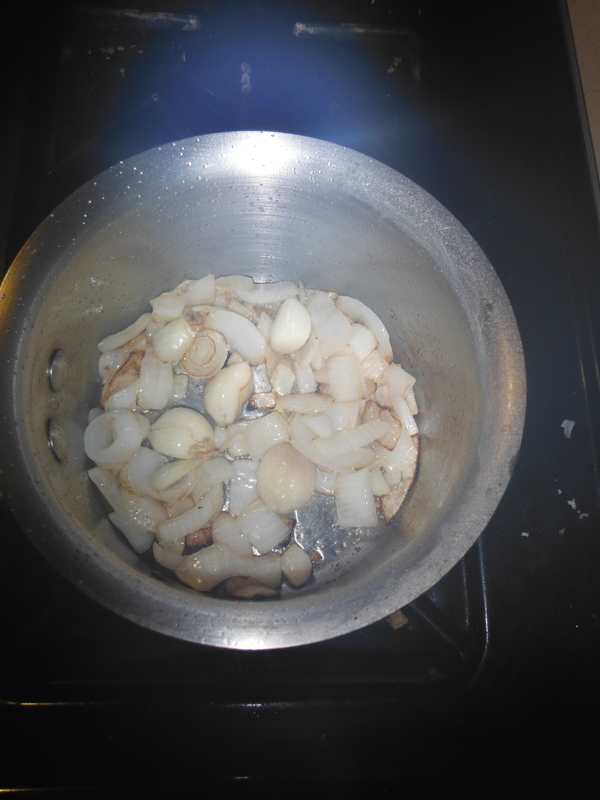 First I start a pan with olive oil, one onion and 3 cloves of cracked garlic. I leave the chunks big so that they will not burn before I get some good color on them and since I intend to blend this soup, fine knife work is unnecessary. DON’T OVER COMPLICATE THINGS JUST CAUSE YOU CAN, it mades for pretentious food and wasted time. It is important to let the heat do its thing. 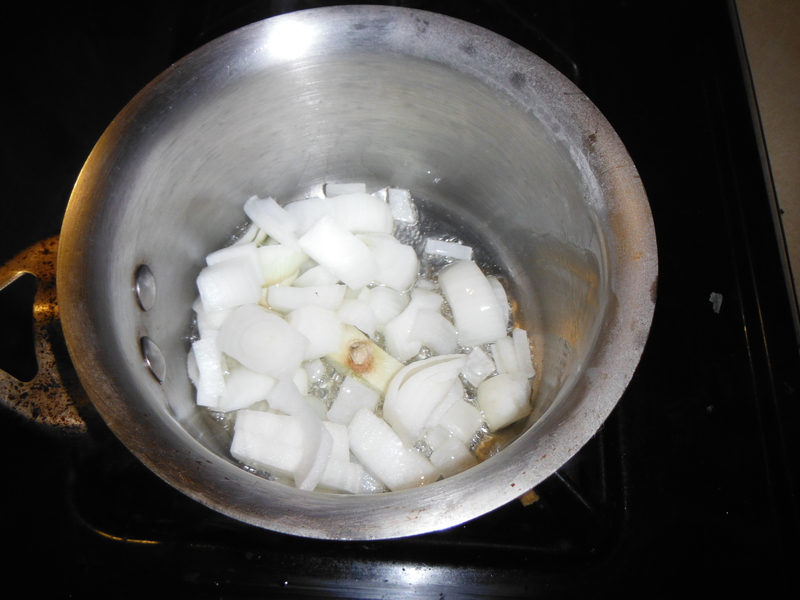 You want to caramelize the natural sugars in the onions. When they get some deep color on them add a good bit of salt. Salt draws out the water in anything and it will help to being out more sugars and deglaze your pan. 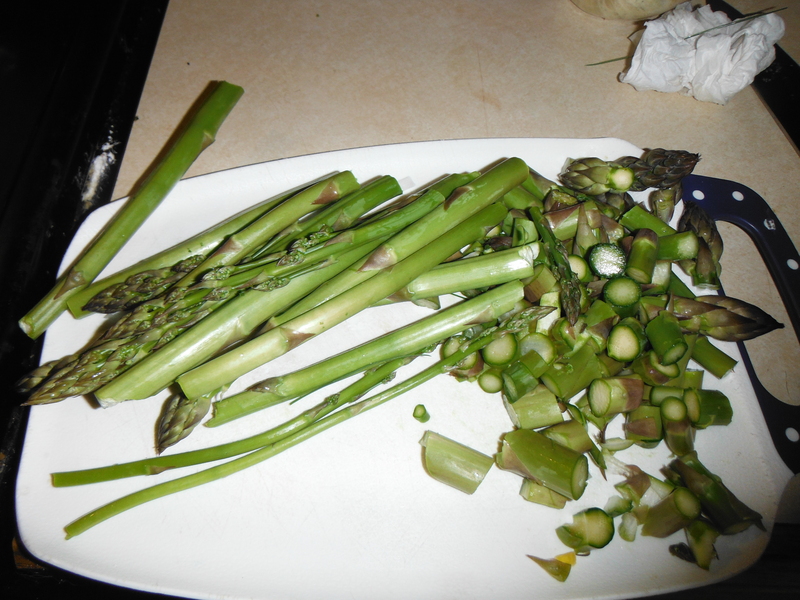 Roughly cut your asparagus and get ready to add it. 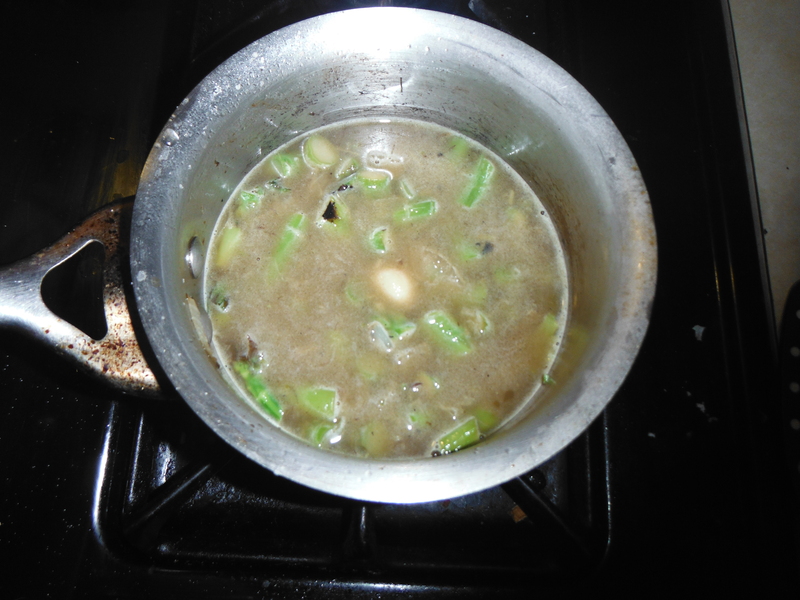 Wait till the onions are almost starting to burn, the water from the asparagus will draw up all that flavor too. 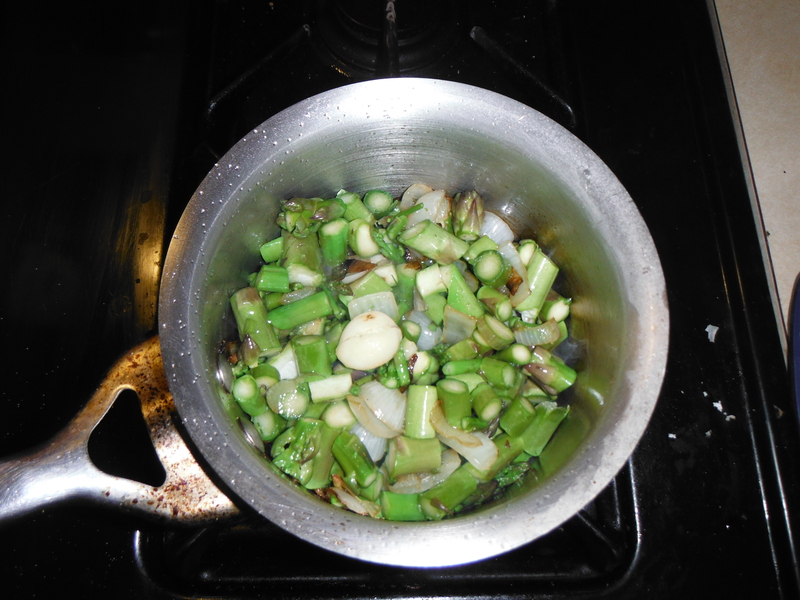 Stir this until the asparagus starts to get good color on the bottom and the pan is dry again. Then add only enough water to cover your vegetables. You can see the caramel color of my water here. I didn’t use any stock or broth that color is due to well caramelized vegetables. Cover and cook for 20 min, until everything is very soft. Then blend. If you don’t have a stick blender I recommend one, it saves on dishes. If you transfer this hot liquid to a regular blender BEWARE! 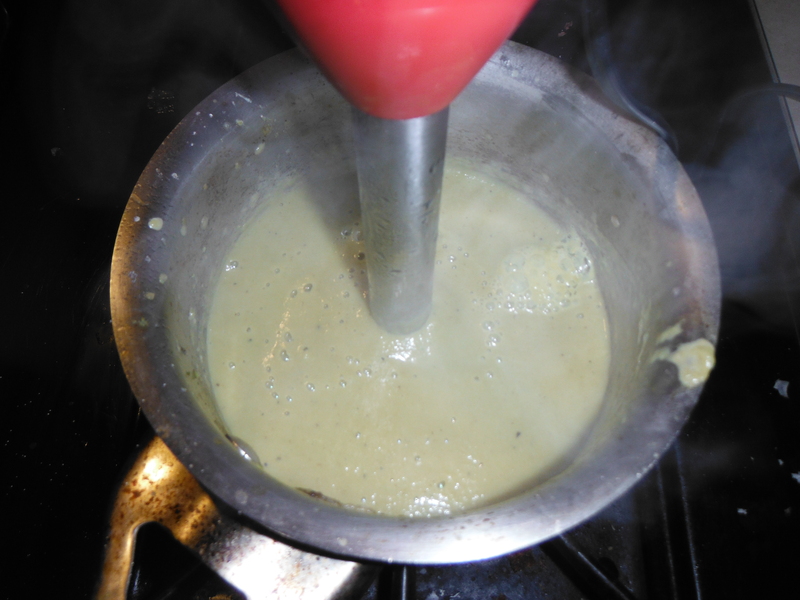 When you blend hot liquids they have a tendency to expand and explode. Molten soup baths are not good. Make sure you start low! Or get a stick blender. I added the juice from half a lemon and that’s it ladies and gentalman. At this point the soup is vegan and almost fat free. 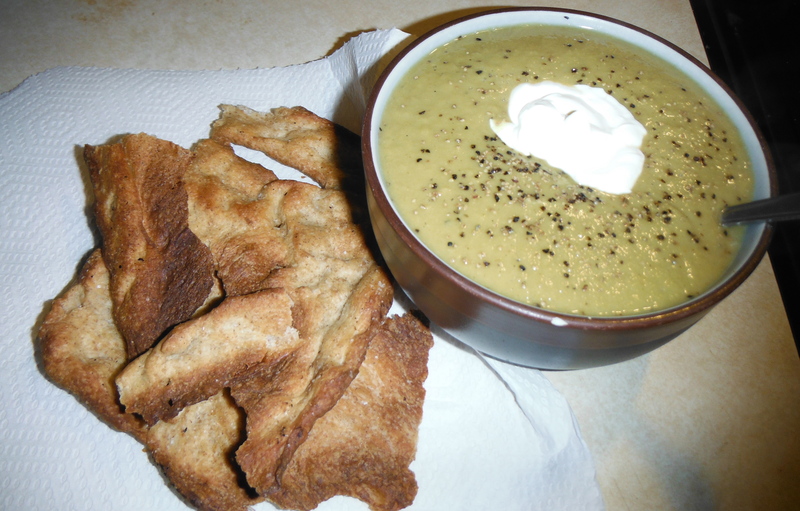 I like to add a dolope of sour cream and black pepper at the end and serve with some flat bread I made with store bought pizza dough pulled thin and cooked with olive oil and salt. Pretty much makes everything better on a cold day. Fills you up and gives you more than a few servings of vegetables. I use the same method to make cauliflower, carrot, squash, tomato soup and many more. Try it on the next cold day or chill it and eat it on a hot one, the choice is yours.